We offer you a 20% discount for the purchase of the 5 or more shows of our program. With a maximum of one entry per show. It does not include the 33th Opera and Ballet Season. By buying the general installment, we offer you the possibility to make a tasting. We offer you a 10% discount in a 33-year title of Opera and Ballet. If you make a TASTE, you can take an exclusive gift (pick up at the box office with the ticket). Only the discount is applied at prices higher than € 12. 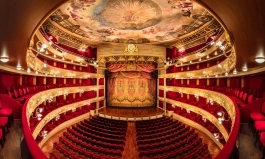 We offer you a 10% discount for the purchase of 2 shows from the 33th Opera and Ballet Season.